Yesterday we got a look at what appeared to be the molding Apple will use to manufacture the iPhone 6, and today a new photo has leaked online allegedly showing off the upcoming smartphone’s battery. 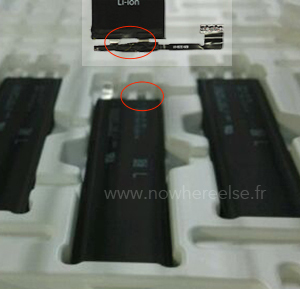 The picture, which was obtained and published by French site NoWhereElse.fr, suggests that the iPhone 6 could be redesigned from the inside out. 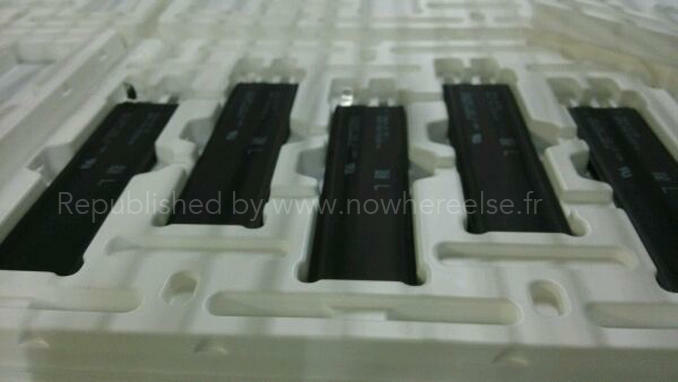 The leaked photo claims to depict five freshly-made iPhone 6 batteries. There’s no way to tell how big they might be or how much power each one holds, but there is one key difference between this design and the battery found in last year’s models. The connector usually found at the bottom of the battery have been repositioned, suggesting the iPhone 6 could see an internal overhaul to match its new design. NoWhereElse also notes that, based on the time frame of today’s leak, we may see an iPhone 6 launch far earlier than expected. The first photos of the iPhone 5s battery didn’t surface until late June 2013, three months before the new smartphone was announced. So either Apple is planning to unveil the iPhone 6 as early as June, or its supply chain is leakier than ever. Based on the latest reports we’re expecting a 4.7-inch smartphone with a slimmer design and upgraded specs this fall, followed by a 5.5-inch iPhablet in late 2014. It’s still early enough for Apple’s plan to change though, so try not to get too attached to these iPhone 6 rumors.